Welterweight Contender and former W.B.C. 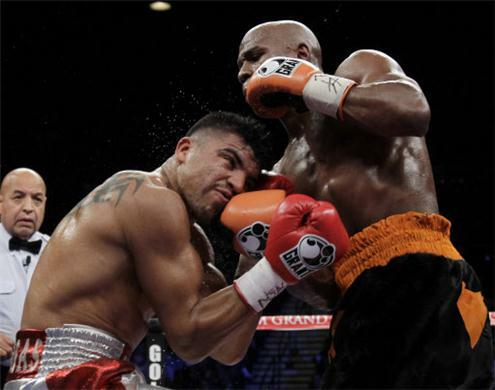 Champion Victor Ortiz is now petitioning to get a rematch of his Floyd Mayweather fight that had a controversial knockout ending in the fourth round. But to me there was nothing controversial about an amped up upstart who got “Knocked The F*** Out” after taking the fight into dirty tactic territory by headbutting Mayweather on purpose then wanted to play the good guy role and become buddy buddy after he split Mayweather’s lip into a grotesque bloody mess! 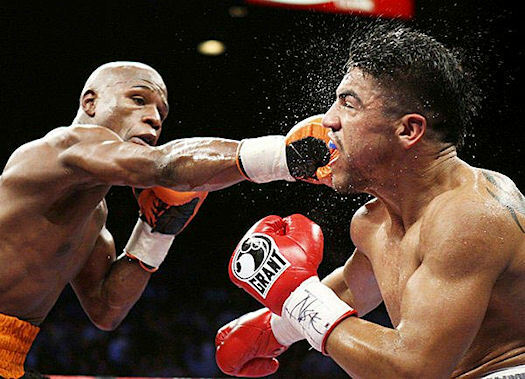 Look, Ortiz wants to now complain about Floyd Mayweather being such a dirty fighter when in fact it is him who started the dirty tactics throughout the fight! This tells me that he sure has confidence in what little skills he has. Granted, he has proven himself to be worthy by winning a world championship but what he has failed to understand is that it is an entirely different ballgame on the championship level and it is even a more immense level when you step into the ring with the likes of Floyd “Money” Mayweather! …….and love him or hate him his is one of the best of our era! What I truly believe is that Victor Ortiz got a taste of the high profile attention and big money and doesn’t want to get back to the end of the line to wait for his chance at the big time again while fighting in smaller venues in order to earn his way back after his loss to Floyd. 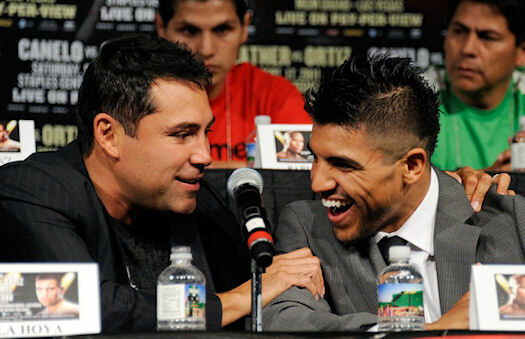 I also thought it was interesting to see the venom come from Victor’s promoter, Oscar De La Hoya, toward Floyd during the build up to this fight. It seemed to be a very personal passion of his that appeared to me to be some type of covert jealousy when you really look at it. …….and as we all know, and outspoken Black man who continues to win big while getting paid big is something that doesn’t sit too well in America at all! Especially in this time of great financial distress on all levels. So this bothers Oscar greatly because although it is a well known fact that he is of a Mexican heritage he feels as though he is “something else” other than what he was born to be because he believes that he is now accepted by the very elite and affluent but on day will gt a rude awakening when he is made to see that he is not. So while he waltzes around the world turning his nose down at Floyd Mayweather because he has adopted the mindset and attitude of those who would at best hire him to cut their lawn and do some landscaping, he better realize that those to whom he kisses up to couldn’t care less about the people who share his Mexican heritage and are only up under him because he is making his money with his company Golden Boy promotions. 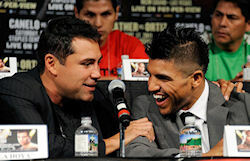 So why is Oscar so determined to get a rematch for Victor Ortiz after this fight? I can understand some of the people might want to see a rematch but is there really any crying out of the masses to do so? It’s all about money and for Oscar and Rolando Arellano, Ortiz’s manager, to openly demand for a rematch only tell me that they are really in it for another big Mayweather payday. Plain and simple, because if they had any long term faith in the so called “steller skills” of Victor Ortiz, they would invest over time instead of trying to cash in right away. It seem like they know exactly what they are working with and Victor is too dumb to see otherwise! Hurry up and drink the milk because it won’t be too long before it spoils……. Previous : The Funny Pages – New Jersey Governor Chris Christie’s Big Announcement!